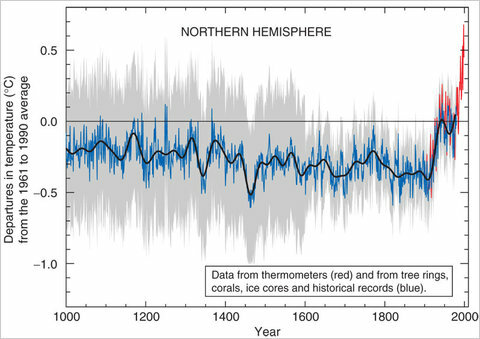 Dr. Michael Mann co-authored the famous graph of temperature trends dubbed the “hockey stick graph.” In 2009 he was was implicated in the global warming email and document conspiracy. Mann’s controversial work has been challenged in the past. Today Michael Mann sued National Review and Competitive Enterprise Institute over his work on the global warming climate change hoax. Mann posted this on his Facebook page. Today, the case of Dr. Michael E. Mann vs. The National Review and The Competitive Enterprise Institute was filed in the Superior Court of the District of Columbia. Dr. Mann, a Professor and Director of the Earth System Science Center at Pennsylvania State University, has instituted this lawsuit against the two organizations, along with two of their authors, based upon their false and defamatory statements accusing him of academic fraud and comparing him to a convicted child molester, Jerry Sandusky. Dr. Mann is being represented by John B. Williams of the law firm of Cozen O’Connor in Washington, D.C. (http://www.cozen.com/attorney_detail.asp?d=1&atid=1406). Nevertheless, the defendants assert that global warming is a “hoax,” and have accused Dr. Mann of improperly manipulating the data to reach his conclusions. In response to these types of accusations, the U.S. Environmental Protection Agency, the National Science Foundation and seven other organizations have conducted investigations into Dr. Mann’s work, finding any and all allegations of academic fraud to be baseless. Every investigation—and every replication of Mann’s work—has concluded that his research and conclusions were properly conducted and fairly presented. Despite their knowledge of the results of these many investigations, the defendants have nevertheless accused Dr. Mann of academic fraud and have maliciously attacked his personal reputation with the knowingly false comparison to a child molester. The conduct of the defendants is outrageous, and Dr. Mann will be seeking judgment for both compensatory and punitive damages.